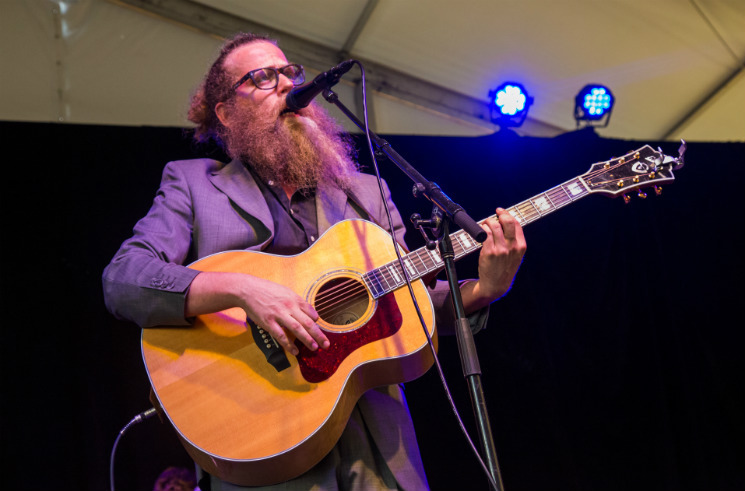 Sitting and singing animatedly at a Steinway Grand piano on the Tartan Homes Stage in front of City Hall, Ben Caplan looked positively debonair in a grey suit — not a bad way to start a five-month-long tour across two continents that began in earnest on Saturday, June 25 in Perth, Ontario. His charm matched the look as he tricked the crowd into cheering loudly for a heartbreak song and goaded watchers to stand in front of a mainly seated audience. His life partner Taryn Kawaja played an old-school melodica while he strummed a banjo, and she rounded out his signature klezmer folk excellently in a piano duo for "Under Control" and provided bright back-up vocals on "Seed of Love" and "40 Days & 40 Nights." Matching Caplan's maniacal performance, Ottawa's own Jamie Kronick (Scattered Clouds) kept the beat booming along at a pace as Haligonian Jordan Stephens danced with his bass as much as he played it. Besides "Drift Apart," from his debut album, most songs played were from his 2015 LP. The album cover of Birds With Broken Wings features Caplan recreating the iconic painting Wanderer above the Sea of Fog, by Caspar David Friedrich, of a man struggling to a peak to look down upon the glory of the world, sums up many of Caplan's laments that revolve around love, loss and wandering. One variance in the album art leads to another as his head is turned to let his beard blow free and his eyes to trace another iconic sight not in the original 1818 painting: the Halifax smokestacks. Which makes one wonder if he's staring into fog or smog — is he describing a beautiful scene or a tragedy? Between sweat stains appearing on his back in the shape of angel's wings and his heart-wrenching break-up songs, his uproarious performance on Monday evening (June 27) raised the same question.